Deswelling agent to prepare corneal lamellar tissue for DSAEK/DALK. 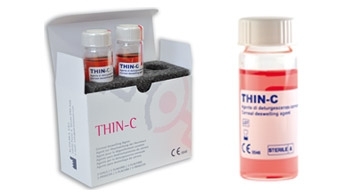 THIN-C™ is a deswelling agent, which is ideal to prepare ultra-thin lenticules for DSAEK, Eye Bank precut tissues for DSAEK and anterior lamellae for DALK. The lenticules obtained after using THIN-C™ show smoother residual posterior stroma and higher stiffness than tissue prepared with the use of conventional corneal storage media and permit an easy manipulation of the tissue during surgery.